TFD » Blog » Posts tagged "cake table flowers"
Wedding Cake Table Flowers: How to Add Flowers to Wedding Cakes? Adding flowers to your wedding cake is a wonderful way to create a unique look that could be romantic and classic or more rustic and boho. They add colour, delicate shapes and textures, and also create a whimsical look that is perfect for spring and summer weddings that are bound to delight guests. Victoria sponge towers adorned with berries and blooms make a decadent, village fete look, while roses added to traditional designs adds a glamorous touch. And of course, edible blooms add a different dimension added to a single cake or quirky cupcakes. There is plenty of quirky and cool things you can do to decorate your wedding cake. Visit Todic Floral Design and find out how to create the perfect wedding decoration for your big day. Choose a multi-tiered Victoria sponge sprinkled with icing sugar for the base of a cake. Simple and classic, it creates the perfect tower of deliciousness to adorn with flowers! Any flowers will make wonderful decorations: from dainty daises and baby’s breath to sumptuous roses and anemones. Bright coloured berries – like strawberries, raspberries and blackberries – and mini sugar biscuits will complete the look. What colours to choose? For a sweet and quirky look, consider pink, peach and cream blooms. For something more rich and almost royal consider deep purple and crimson roses, with purple grapes to add to the decadent look. 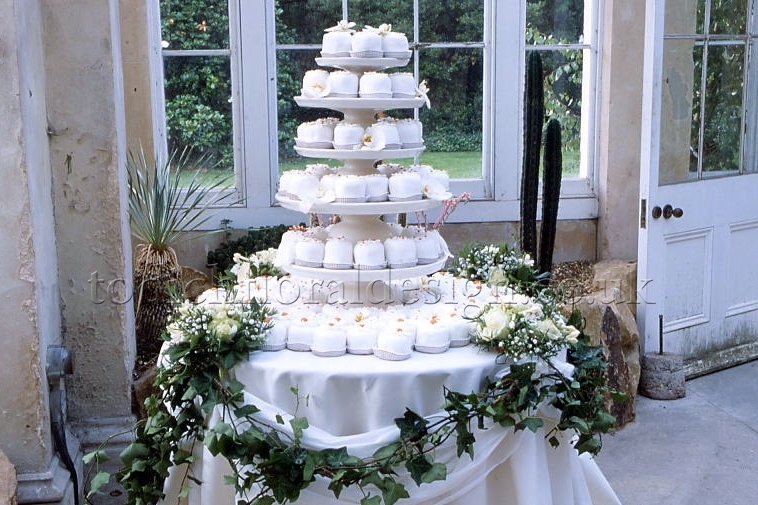 As well as berries, succulent are very popular and make lovely additions to a wedding cake. Dashes of greenery (ivy, eucalyptus and other leaves like fragrant herbs are also ideal) create a fresh, woodland look for wedding cakes that certainly fits with a more rustic, boho theme. For wedding venues in the countryside this is the perfect choice. For a classic, traditional look, it has to be roses. A traditional tiered cake cased in white icing serves as a blank canvas for the romantic floral embellishments desired. Roses in pastel shades of dusty pink, peach and white make beautiful additions to an elegant wedding cake. Sprigs of greenery can also be added, as can smaller flowers like hydrangea florets, freesias and wild flowers like daisies or forget-me-nots. Beautiful shapes and textures can also be created from different sizes and colours of roses winding down wedding-cake tiers, dotted around the cake or as the crowning glory to the design. Tumbling peach and white roses create a really show-stopping but elegant look. Of course, in addition to flowers that adorn the cake, cake table flowers are a traditional adornment in many weddings. Adding beauty and colour to this central focus as the newly weds make the first cut, floral cake table arrangements are worth thinking about including in wedding floral design. Individual cupcakes as an alternative to a traditional wedding cake has become very popular in recent years. They can be decorated in a vast array of different icing designs: from iced flowers, to lace patterns, with additional edible pearls, sparkles and jewels. Cakes can also be decorated with flowers like hydrangeas and roses, whether directly on the cakes or to add to the cake stand itself. Edible flowers are also a great choice: lavender, pansies, dahlias and marigolds can all be added to sweet treats to create a truly beautiful look.